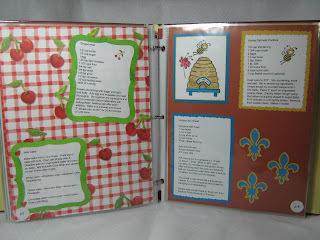 Okieladybug's Scrap N' More: Linda's Recipe Book - and a Giveaway! 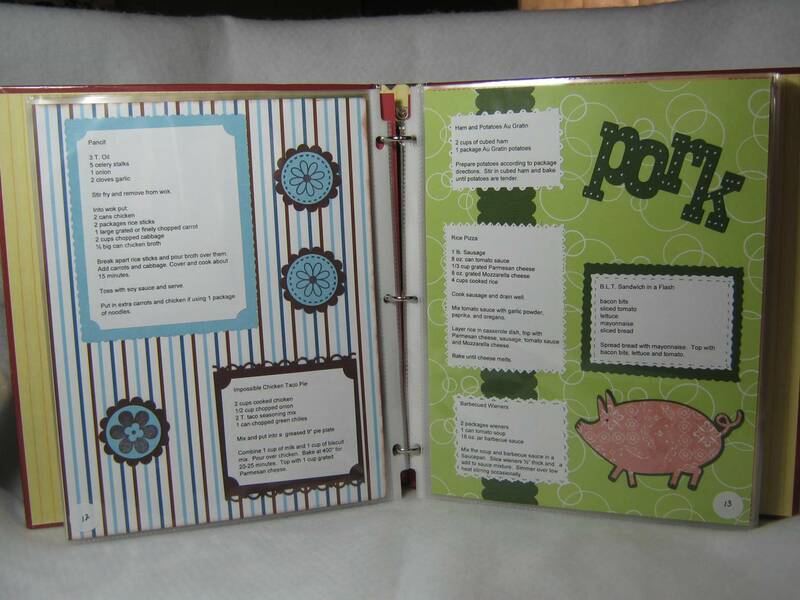 My friend Linda, aka LGuild, made a recipe book and posted a few pictures on the Cricut Messageboard and was asked to post all the pictures. Linda doesn't have a blog and didn't want to take up MB space posting all the pictures so asked if I would post them on my blog *okie thinks Linda was just being lazy and wanted okie to take all the pictures and have to post them*. Of course I told her I would be more than glad to help her out *okie sometimes is not such an honest injun and might have lied a little about being glad about it*. Linda came down for Stamp Club yesterday and we had some errands to run and then came back and took pictures of the pages. I think she did an excellent job on her book. 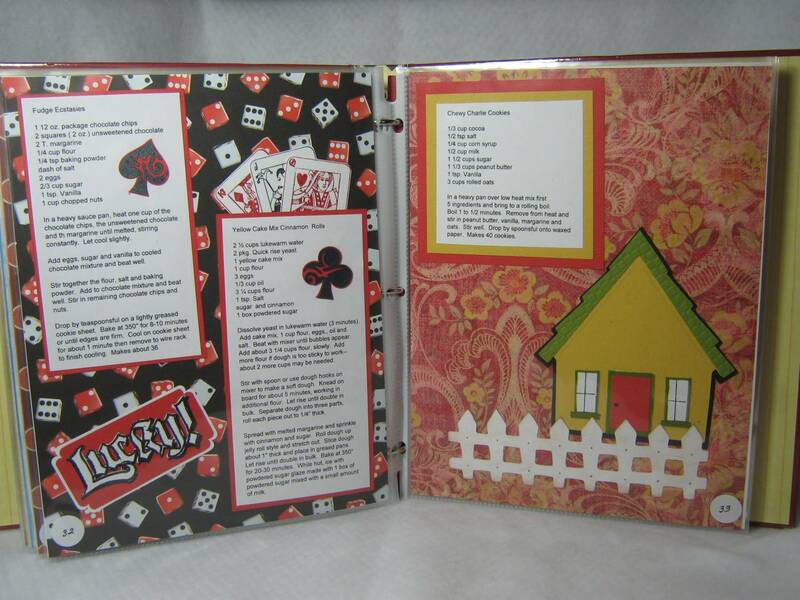 Linda is not a scrapbooker, she is a card maker. So this was quite the stretch for her...matter of fact she said she had smoke coming out her head from trying to come up with ideas for all the pages *okie think the smoke was actually from Linda just using her brain and not stealing ideas from other people*. Linda said "not every page has Cricut cuts on it but this was quite an undertaking for me since I make cards". She did use stickers, stamps and Cricut cuts. She also said "if someone asked me to make them one I would say 'YEAH RIGHT! Not in this life time'" *okie cracks up laughin*. So without further ado here are the pictures!! Oh and remember you can click to make them bigger if you want to see more detail. First three pages..the index is actually turned the other way, just turned it for picture taking. Pages 4 and 5. Pages 6 and 7. Pages 8 and 9. Pages 10 and 11. Pages 12 and 13. Pages 14 and 15. Pages 20 and 21. Pages 22 and 23. Pages 32 and 33. Pages 34 and 35. Remember to leave your comment for a chance to win Linda's Giveaway!! Great job, Linda! You can no longer call yourself "just a card maker"! Beautiful cookbook, she did a wonderful job! The recipe book came out fantastic! Love all the colors and detail. 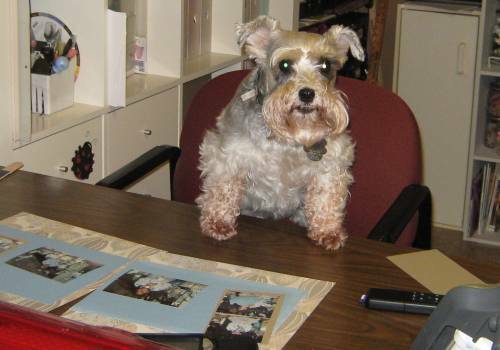 Linda should probably try to make scrapbooks, she did a fabulous job. TFS! Love this recipe book. What a great idea. WOW! For someone who claims this was a "Stretch", it is AMAZING!!! I love the fact that all the recipes are pretty simple and the way the pages are laid out, it really focuses the eye on the recipe card! No noisy distractions! I LOVE IT!! WOW!!! Fantastic!! I hope to have time to make one with all of my favorite recipes from my Grandmother. Thanks for helping Linda share her wonderful creation Okie! Love the recipe book!!! Linda, you did a great job and Okie, you were your usual nice self to share with Linda! Hugs to you both. Happy Holiday!!! This is a great recipe book! 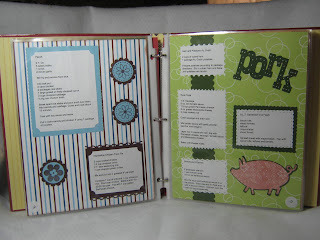 I've been "tempted" to make one with my family's favorite recipes that have been passed down. After seeing your cook book, I might just have to do this. :) Great job! I love recipe scrapbooks. I started one a couple of years ago and only have about 5 pages done :( I've been to busy making cards. I need to get started on it again. This one looks amazing. Oh, it's absolutely wonderful! I love every page! I recently have finally gotten around to starting one. It is SO much work! I've really barely started, only made a few cuts and assembled, I know I'll be still working on it this time next year! lol. Big accomplishment here, and it looks so fabulous, you'll be able to proudly pass it on in your family for many generations to enjoy! I love it! The book came out so stinkin cute. I might have to lift it from her...lol. 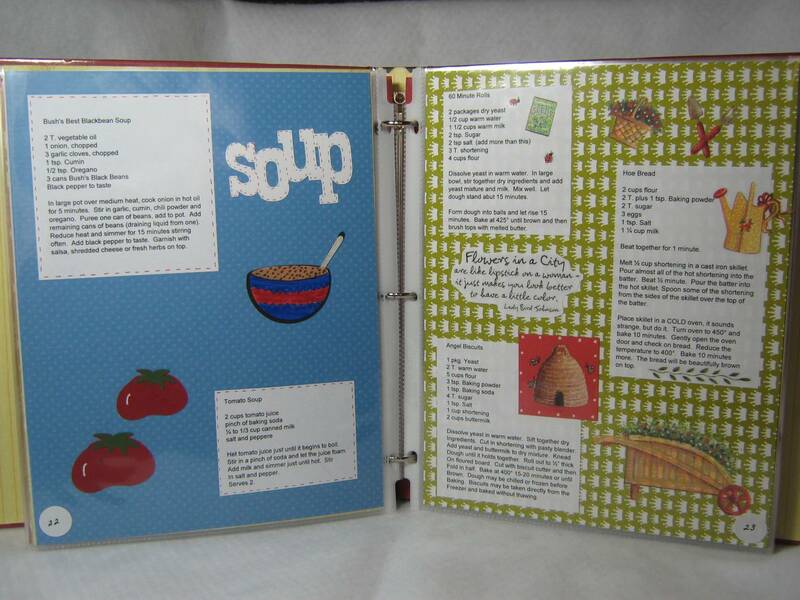 The recipe book looks great! I wish I had time to organize mine as nicely as she did. Linda- I love this, will you make me one?? LOL...j/k you did a great job!!! Linda, What an awesome undertaking!! Your book is breath-taking. Love the cookbook! The pages are perfect, they are not over embellished or busy. She did a great job on it! This is a great project. 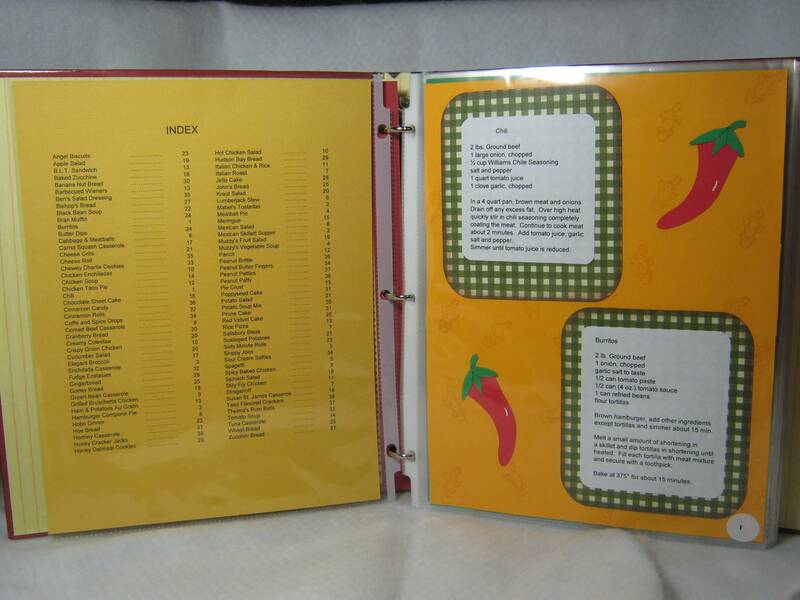 I have all my recipes in a small index box and they are very unorganized. 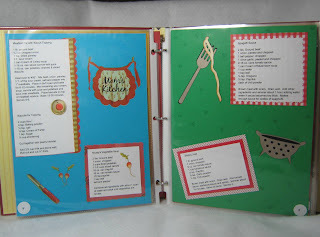 I love this recipe book and now I want to work on creating one for my family. Thanks for sharing! That really turned out to be a nice cook book!!! This is an amazing cook book. So much more to it than recipes. Great job. I just love this. Ive been wanting to make one of these forever! You're giving me some really great ideas! What a great give-away, thanks for the chance to win! Linda, My question is did you make this for yourself or someone very special? You did an excellent job! Scrapbooking is obviously in your blood. Now you need to branch out. I have many projects, even cards that are one of a kind and will never leave my craft room. Welcome to the other side. Now you will have twice as many creative outlets! Great job!!!! This turned out very nice! Is it wrong that I'm secretly happy that the pictures show the recipes perfectly so I can try a couple?! :o) Great job Linda! Great job Linda! And Okie, that was a lot of work to post all those pictures. What a friend. That is an awesome cookbook!! I want to try a big project like this! Wonderfully done! Linda done a great job! Very nice of her to do a giveaway as well! Great job Linda!!! That is beautiful and perfect! Okie, you get a round of applause for posting this! Nice Job!! I did one for my daughter that got married last July, everybody loved it and wanted one, so....we had a cookbook making day and they all worked on their own so I didn't have to do them all. I added pictures so they could see what each food is supposed to look like. WOW, I can see why Linda had smoke coming out of her head... This is just AWESOME... I love it and if you decide you don't want it Okie, I 'll take it. So cute and such a great creative idea! Thanks so much for sharing! Awesome! 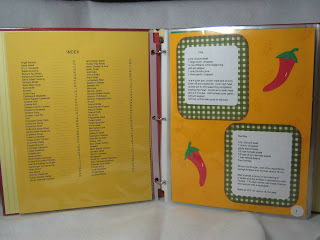 Makes me think I need to do something with my notebook that has recipes hanging out all over! This is such a great and creative idea! Thanks so much for sharing. You did an amazing job! This definitely inspires me to try something like this to make and give as gift to my grandma! Wow, great recipe book. I've been meaning to get one done for the kids and never got around to it. Thanks for the inspiration. WOW! what an awesome book, no wonder you aren't giving it away! Great job, to both of you! Great job, Linda! 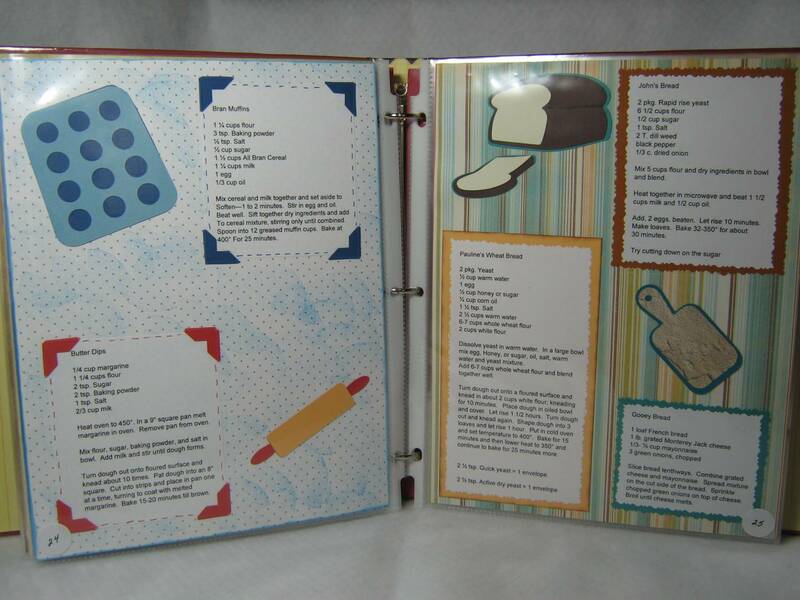 Your cook book looks awesome! Wish I had the motivation to do that. Sure you don't want to make one more? LOL. The cookbook is really cute. You did an excellent job, thank you for sharing! Thank you guys for all your nice comments! I agree that it was very nice of Okie to put these on her blog. It did take her quite some time to do the photos and get them uploaded but she did a good job on them. Now I know how she uses a "light box" to make the photos come out more clear and am going to try her method next time I post a photo on the MB. Bobbi- it took me a total of 6 days to get the pages done. Whew! Emily-scraplift away! I'm well known for scraplifting myself! goatesgirl--You HAVE GOT TO BE KIDDING! LOL! Cathy-no, I made it for myself. These are recipes I use all the time and I wanted them all in one place. 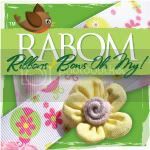 I'll pick a random winner for the RAK and Okie will post the winner here on Thursday, July 8th. WOW! Linda did a wonderful job! And how sweet to do a giveaway! Now that was a lot of work, Linda! You did an AWESOME job on this book! Love it!!!! Thanks for sharing the idea with us. Wow! Great book! Looks like lots of hard work and love went into the book! Wonderful job Linda. I just love it. I need to get busy and do the same thing with a lot of my family recipes. Love it! 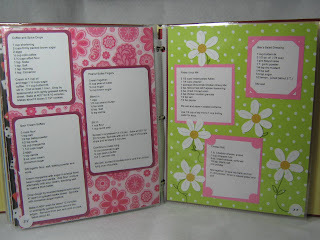 I am so excited to see a recipe book...that is on my list of things to make! 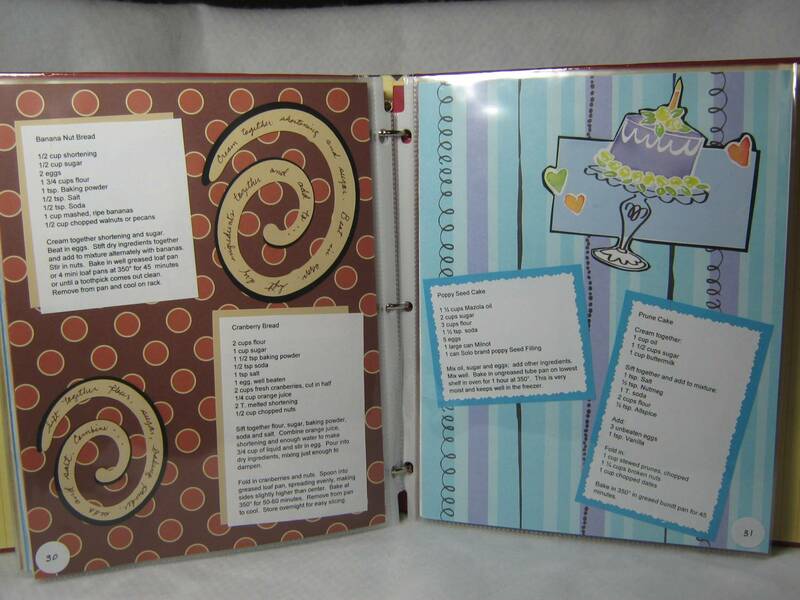 Love your recipe book! I can tell you put a lot of time and hard work into it, but it turned out fantastic. Thanks for the chance to win your giveaway. You did such a great job, with lots of thought and hard work. Thank you so much for sharing this with all of us. 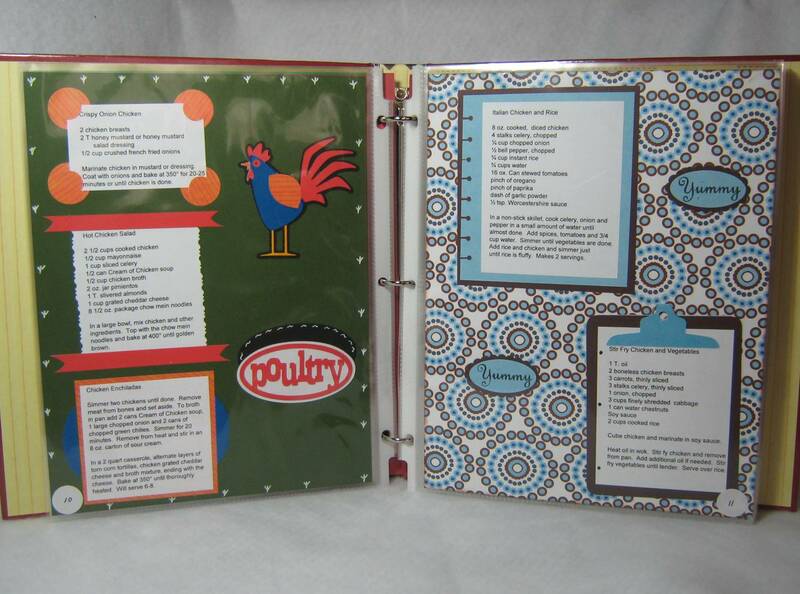 fantastic job on the cookbook! 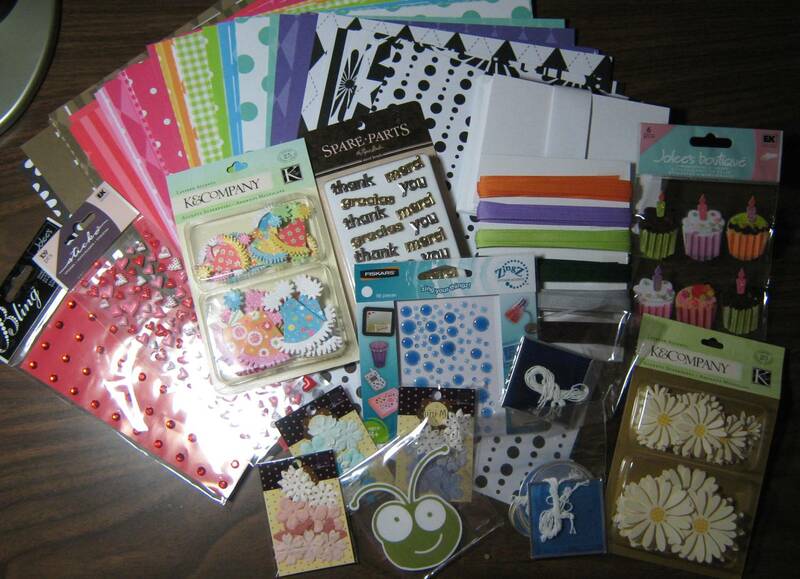 somehow I think you have graduated from "just a cardmaker"! thanks for the opportunity to win! 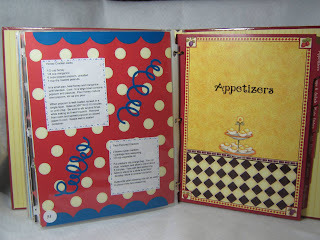 Awesom recipe book. Thanks for the ideas!! Marvelous job on the book! That is a lot of different Cricut cartridges, and some pretty nice stamping work as well. And Okie, you crack me up! the cookbook is totally precious! That gave me great ideas for b-days and Christmas! Love it! What a great idea. This is certainly a labor of love that your good friend Okie will claim once it's all said and done. (-: Thanks for sharing your work. Wow! That was a lot of work! Thanks for the give away. WOW that is beautiful!!! what a treasure to have... Thanks for sharing and the chance to win. WOW, what a lot of work, but what a treasure. I think I might just have to do one for my girls for Christmas. Thanks for the inspiration. Super Job Linda, For someone who's not a scrapper you did a fine Job. Really great job on your Recipe book.. I can see you put a lot of work in it..
Great recipe book, Linda! 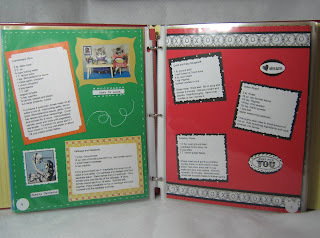 You can definitely add scrapbooking to your list of talents! And thanks for the chance to win! Tell Linda she did a great job. 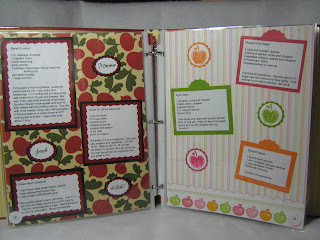 I have been wanting to make a recipe book myself but haven't done it yet. I love the cookbook! I want to make one for myself if I can find the time! By the way, I think I should win the givaway since I have a birthday this weekend!!! You have done an EXCELLENT job on this! If you don't mind, I'm sending a link to my cousin. 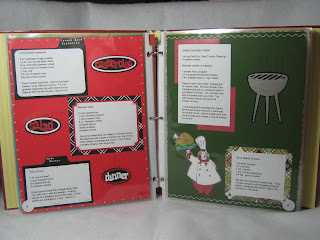 She's getting ready to make receipe books for Christmas presents and I'm sure she'll love "scraplifting" some of your ideas! Okie, thanks for helping Linda to share! Wow! The recipe book is fantastic. I don't know how she came up with enough ides to do all of those pages. It's very well done. Wow! What a wonderful keepsake. Looks terrific. Congrats on finishing it. Awesome. I love the cookbook. I made pages similar to yours. I really like the way yours look, so professional. thanks for sharing, and the opportunity to win. 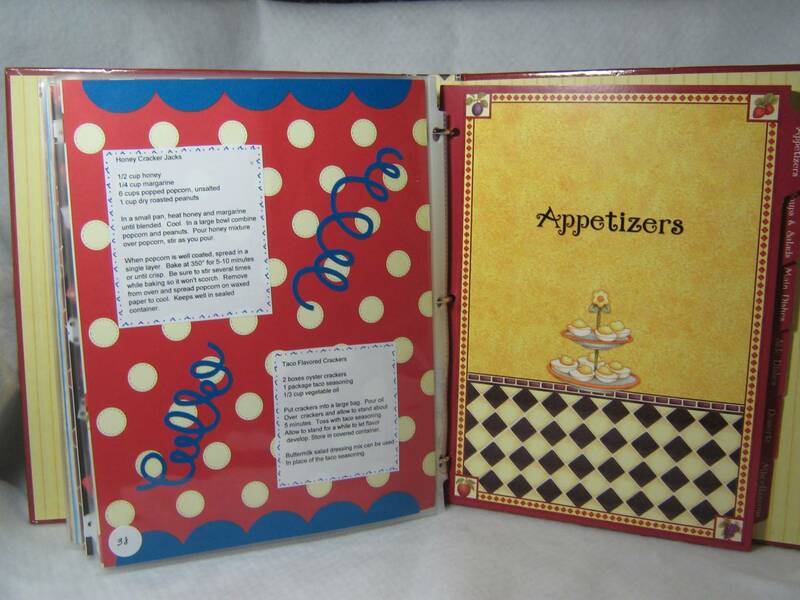 I love the pages, you are very crafty as well as a cook. Thanks for the many ideas you shared. Great job Linda!!! 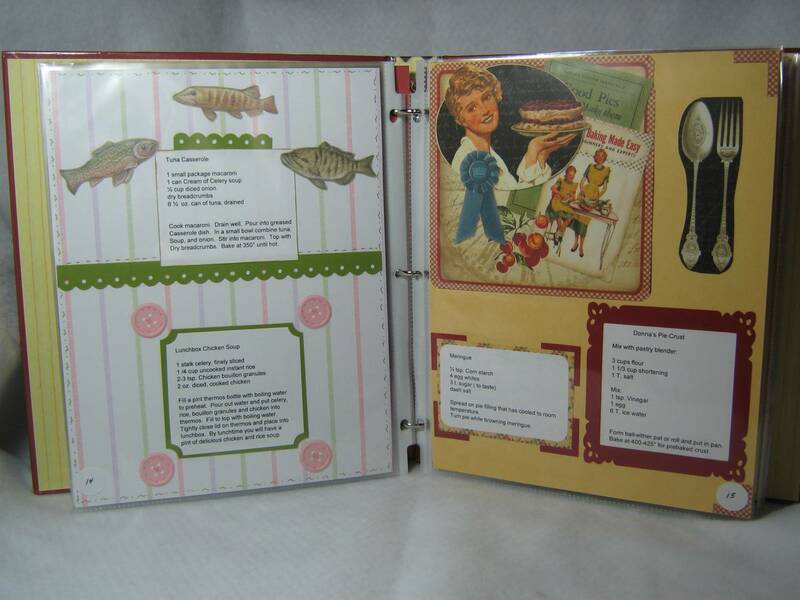 What a wonderful cookbook, looks like your not just a cardmaker anymore! 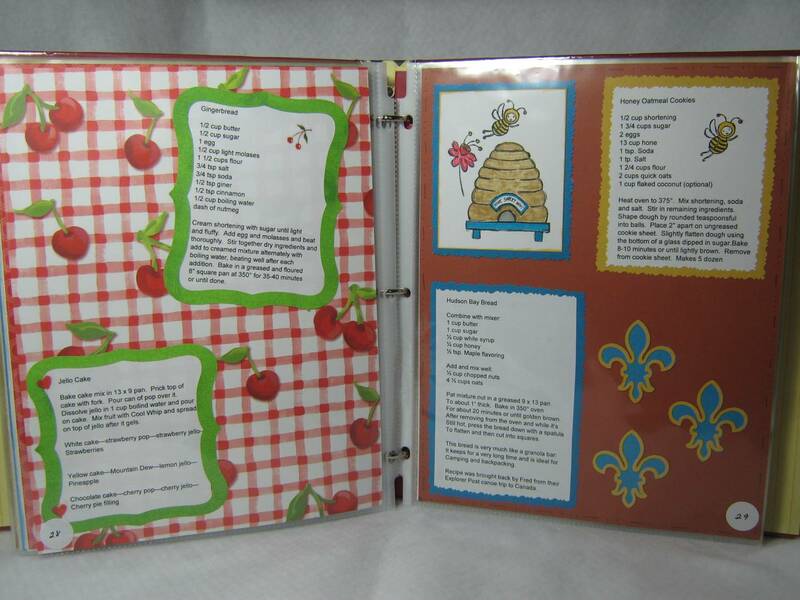 Linda you did a fabulous job on your recipe book. You are really lucky to have a friend like Okie to post all those pics for ya! What a great book! It looks great! I would love to try this sometime! That is super cute! 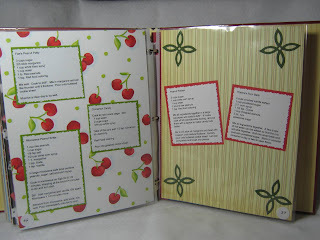 I have a few cook books that I have like that, I did not do all the pages myself (I did it as a swap). I would love to win the goodies! As one who regularly makes recipe pages for swaps at our church . . . well done!!! You did a FANTASTIC job! Just lovely Linda! I've been thiking about creating one of these for my famiy and seein your just may have given me push I needed! Very nice. I've been trying to come up with some ideas for a recipe book. Thanks for the inspiration. You did such a great job Linda! I remember seeing what u posted on the MB. And Okie such a goodfriend to post them up! Keep up the good job ladies! Cute recipe book Linda! Sounds like you and Okie had a great time! I love your recipe book, You did an awesome job. Thanks for the chance to win. Fantastic recipe book. 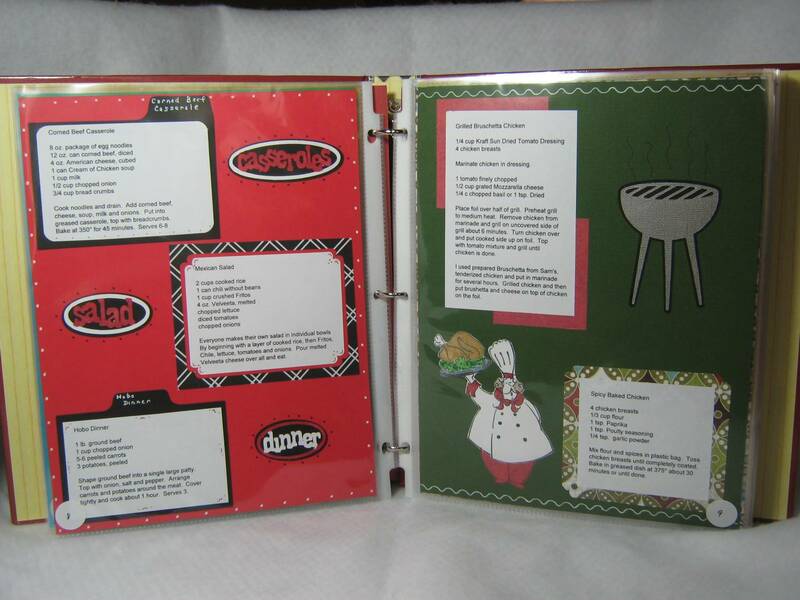 You did a great job mixing designs with the recipes. Thank for a chance to win our giveaway! okie... good friend! this book is what families want to see, not just about presentation but about substance. 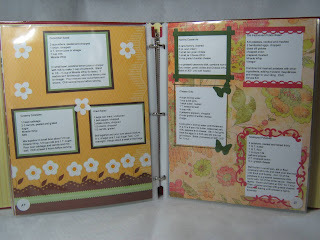 recipes that are treasures that should be scrapbooked! 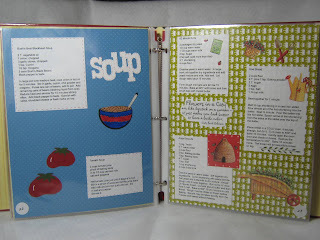 What a fabulous recipe book! Inspires me to make one too, but it'd be pointless since I don't cook -_- Thanks for sharing! WOW Linda, you did a fantastic job! This looks GREAT! I am planning on making one for my daughter for Christmas. I think I better get started now! Linda did a really wonderful job!She deserves a standing ovation!! Love the recipe book. What a great idea. I think Linda needs to get herself a blog so that we can see all her work (especially if it is as good as this). I loved your recipe book so much that I am inspired to start one for my little sister who just got engaged! She moved away from home for the first time and is always chatting on facebook about not knowing what to make for dinner! This is beautiful!!! Linda, your recipe book is amazing. I am going to scraplift it a bit as I am starting a new path to healthier eating so I can make a book with all the recipes that I will be using from now on. Thanks for the idea. A job well done!!!!! That book is just beautiful. You did a wonderful job. Thanks for the RAK and chance to win. Awesome recipe book!! I love it. How long did it take to do? Beautiful,Fun Book you did a great job. Wow! I love Linda's cookbook. I would like to have something like that! Ohmygoodness, Linda!!! :) Can you say INCREDIBLE?! I absolutely LOVE your recipe book!!!!!!!!!!!!! You did such a great job! I would love more information: Where did you buy the notebook? What size is it? 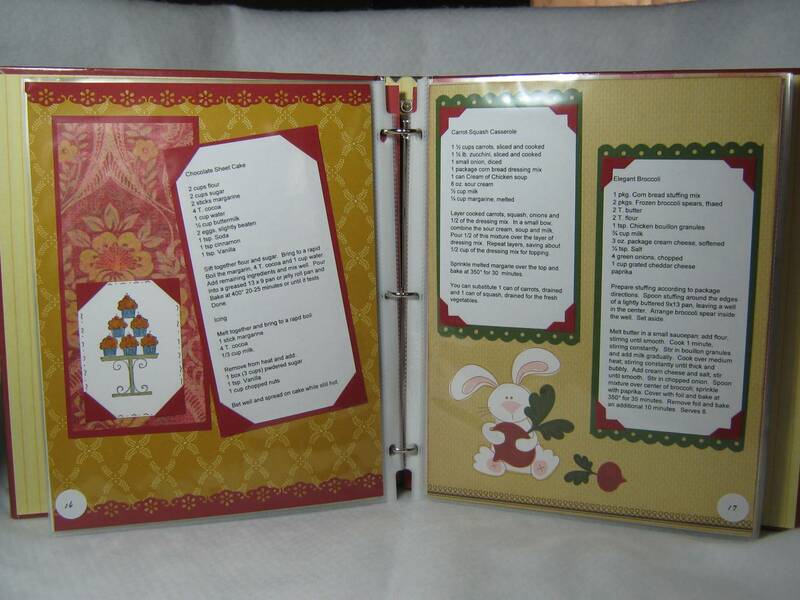 I have been planning on starting a recipe book (I have a friend who has been adding to hers for years), but like you, I consider myself a card maker & I know it'll take me forever (how long did it take you to do so many pages with such amazing detail?)! This is awesome Linda! Thanks Okie for posting the photos on your blog for her. What a fantastic giveaway also...thanks for the chance to win. 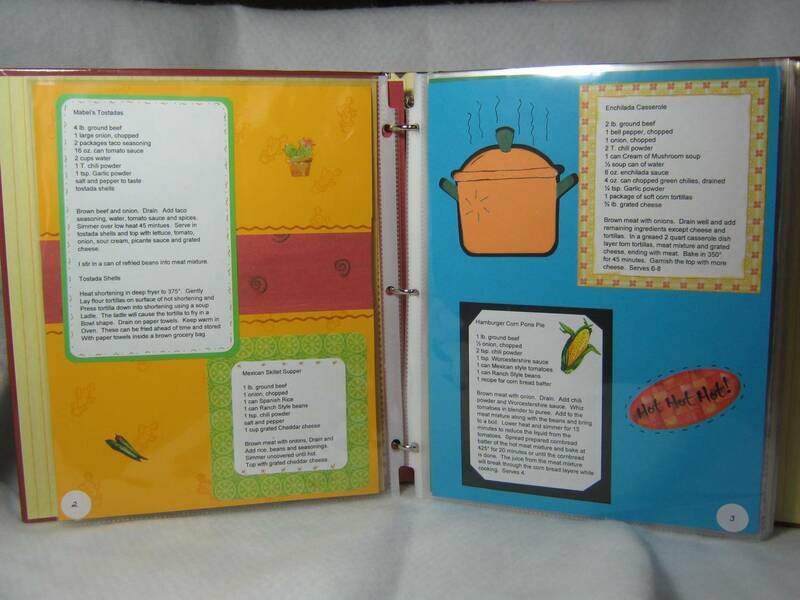 Linda did an excellent job on the cookbook! Okie, nice blog and it is easy to read blog. In my NOT SO HUMBLE opinion....I still think Linda should give away the book.....but I would be happy with the pack anyway! Talented duo that created this! Great job! Thanks for sharing the rest of the pages, I really like it. Linda you did a FANTASTIC work on your Recipe Book. Seriously, I attempted last fall & couldn't get through it. That was very nice of you Okie to post this for her! Super Job Linda. I have wanted to do something like this for a while and still feel a little intimidated. Your's is beautiful!!! Wow just amazing! i will need to pull down grandmas book and see what i can come up with! thanks for your hard work! it looks super. What an awesome recipe book!!! I might have to scraplift that idea and try one for my family...I've wanted to make a cookbook for each of my siblings of all our family favorite recipes from our parents/grandparents and this would be a fun way to organize them all. Thanks for sharing and again AWESOME work.. The book is beautiful! It makes me actually consider doing something like that! I make lots of mini books, but never anything bigger than that with a true theme. Even my scrapbooks are just mixed up things! Thanks for a chance at winning! love it. great idea. I think of my self as a "just" a card maker also, so I know what you mean. 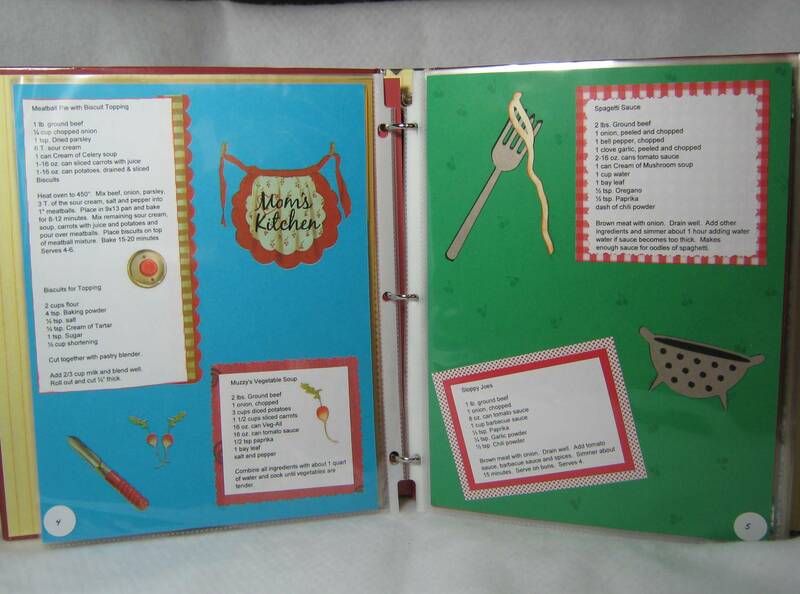 Linda what an AMAZING job you did on the cookbook. I do want want in the giveway but wanted to let her know NICE WORK!! Who ever gets this is going to be very blessed! Linda, you did a wonderful job on the Cookbook,BUT you are going to have to share some of the recipes. This is really nice and simply inviting to try all the recipes. Great job and congrats for all the hard work you put into it. Spectacular Job! I can't even imagine the hard work and love you put into that book. You should be so proud! That had to take her a long long time. But I love it! 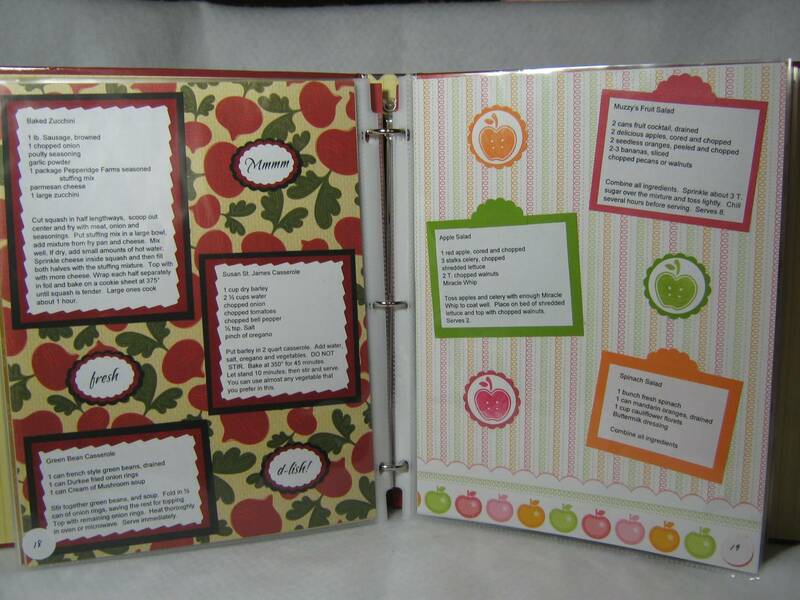 Thanks for sharing ... gots eome great ideas for recipe cards .... don't think I could do a whole book myself! PS Okie what a great friend to take all the pictures! OMG her book is amazing!! I am just in awe over it! Great job Linda! I love it looks like a lot of work! great job and a lot of work. Your cook book is awsome. you did a great job on it. 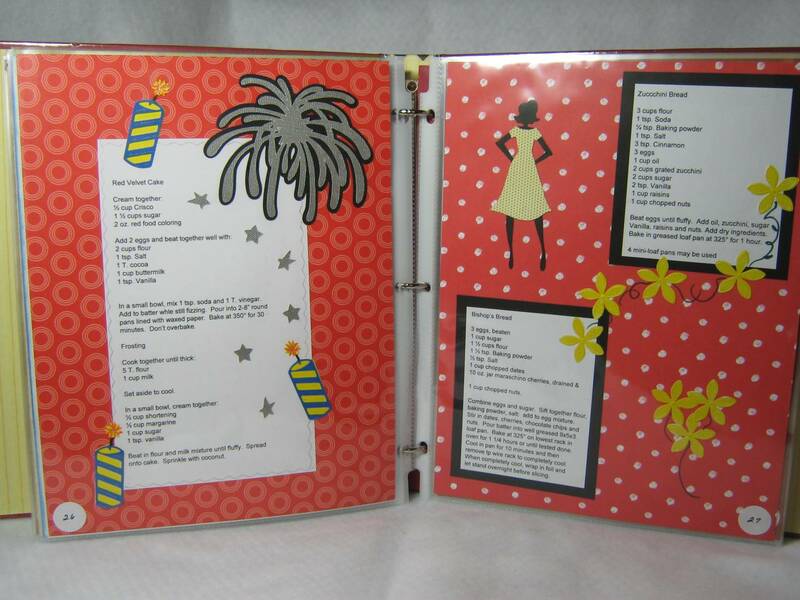 Your cookbook is so cute! 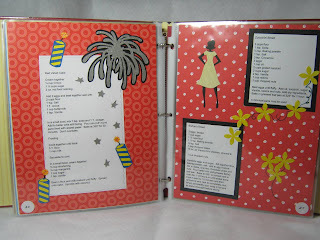 I am doing something similar with a group and we swap recipe pages. It makes cooking more fun! Linda, this is a awesome cookbook idea. I have five children that always ask for some recipe. I think I will start making each child one for Christmas. Thanks for the wonderful ideas and the giveaway. It's just so Kitchey, it's Cool!!! you have to tell Linda that her cookbook is wonderful!!!! I LOVE IT!!!! What a fantastic Idea and should she or you. ( I know you have first dibs on it) I'll take it. This is my first time on this blog but, like arnold ( but without the glasses and guns), " I'll be Back!" That is gorgeous! I need to make a fun recipe book. Thanks for the inspiration. What an awesome cookbook! There are probably some great recipes in there. What a great giveaway I hope I win! 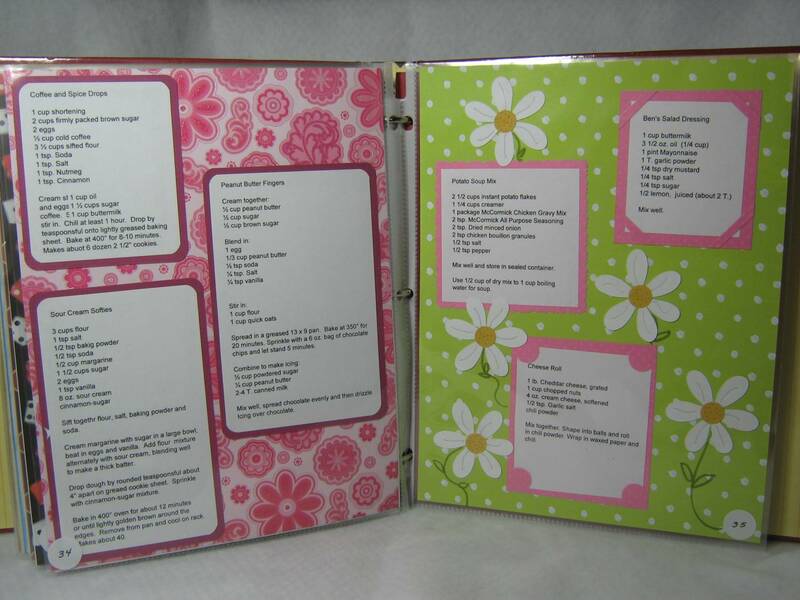 Planning on making my girls a recipe book for them, before they get married. This is the third time i left a comment hope it goes through. 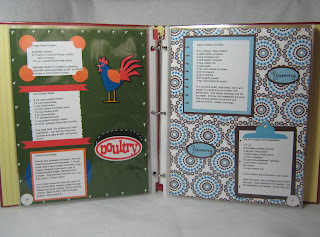 I plan on making a recipe book for my girls of their favorite foods. Linda, you did an outstanding job on this! What an amazing creative project! WOW, great job. And in only 6 days! I always love looking at your work. This is something I should do. Does the RAK include a copy of the receipies too! LOL My family would appreciate that. I not only get in a rut scrappin, but I get in a rut cooking too! Seriously, You did a wonderful job. And, Okie what a wonderful friend you are to post this for Linda (and all of us). I am going to make one like this. And put all my favs. in it. thanks so much for the inspiration. Cant wait to start. Maybe tomorrow. I think Linda can officially say she's a scrapper now! Awesome job, Linda. OMG - this is amazing! I think she is an AWESOME Scrapbooker! WOW!!! That's some recipe book. Great job!! Linda, WOW, WOW, WOW--you did an awesome job!!! I've been wanting to do a recipe book for a while...you just may have inspired me! Thanks for sharing your creation. WOW that is a lot of work but you did an awesome job. I hope that i can be picked for this. THanks for the RAK and such a wonderful thing for you to do. Great job! 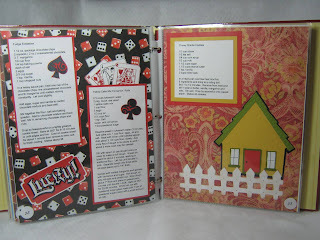 You are a great "book" maker as well as cards! :) Thanks for the chance to win! What a great cookbook! I have been trying to plan one for my DIL..this is a great way to do it! Thanks for the inspiration! You are too cute! Love that recipe book. I just love it!! Wow! That is fantastic. It looks wonderful. Great cookbook! Now you are a scrapbooker too! I can see how much thought and work went into the planning and executing of this. WOW! Very impressive. It makes my recipe book look sad. This is very creative. I will be taking some time to make a cookbook in the near future. Thanks for sharing your creativitiy. Wow, this is awesome! Great work!! What a great recipe book. Great job. Thanks for an opportunity to win the giveaway. Wow! What a wonderful job you did. I'm thinking I might do this X 3 for my three kids for Christmas gifts. They are always asking me for certain recipes. What a great idea! Thanks so much for sharing. awesome recipe book! and what a wonderful giveaway too!! Happy monday! Great job on the book...you will cherish it. Worth the work. Thanks for sharing! Thanks for the great ideas. My mother passed away 23 years ago and I have some of her recipes. 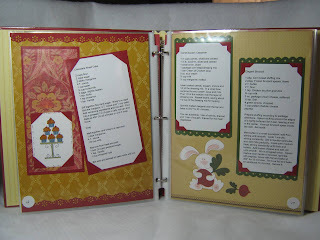 This is a great way for me to cherish her recipes and also do one to give to my brother's family. Thanks for sharing! Wow Linda's book is wonderful! I just love each and every page! Thank you for sharing it with us! Fabulous cookbook! Okie you are such a good friend to post these lovely pics for her! I know what I'll be doing to my recipes now! LOL! I love IT! 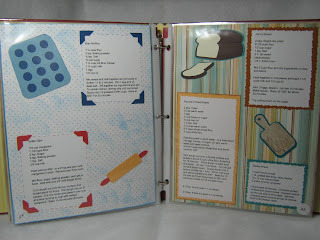 Cute recipe book! Thanks for showing it off! I love the cookbook. Please pick me to win the giveaway, I will love to have Linda's recipe book. This book is fantastic and you are a FAB friend Okie!!! 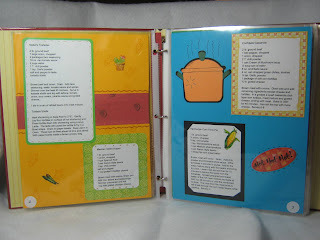 She did a great job on the recipe book. This would make a great gift idea for my kids to pass on older family recipes. Also, great job on the pictures. Thank you both very much for sharing. Wow... I would have had smoke coming out of my ears too!! You did an amazing job Linda. Wow Linda - that is quite a book! Very inspirational. Okie you are so nice to share your blog. Thanks for the chance to win. Thank you for posting - err arranging to have it posted. 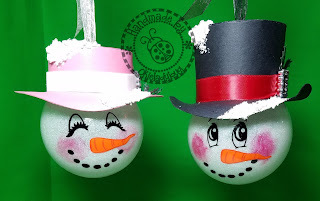 I think I can do something like this - I have From My Kitchen and the DCWV paper used. TFS and for the giveaway. OMG! That is truly an awesome project! I am totally amazed at how wonderful it is! TFS! Very eclectic and full of variety. Surely your family will treasure it for many years to come. Have a great day! Wow, I just love the cookbook. I have been wanting to start one for my boys. This really makes me want to get started right away. Thanks for sharing. 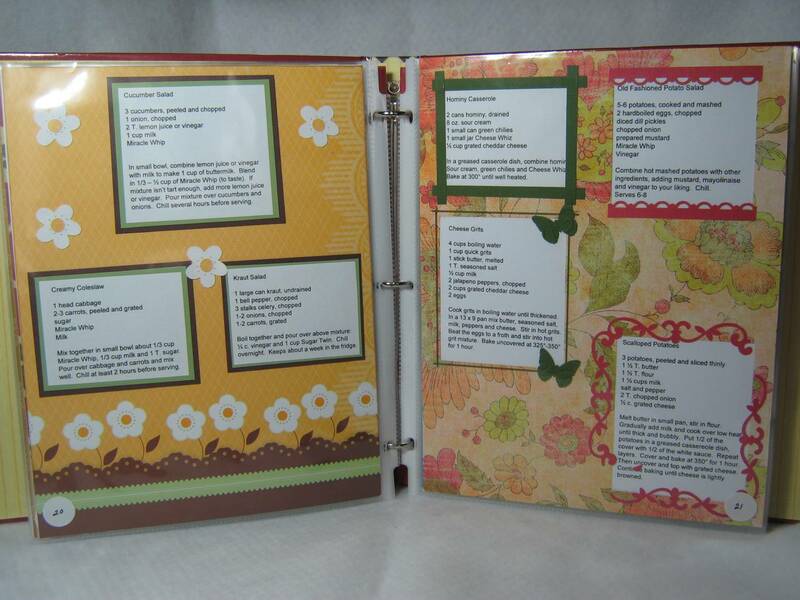 Love making recipe books. Made one for each of my daughters and gave it to them for Christmas. I knew I had done the right thing when they said it was probably the best present they had ever gotten. You did a great job. Your cookbook is awesome.I love all the detail.Great job. Wow! I love this recipe book! I love all the details! I have been wanting to do something like this for my Mama (I don't cook, unless hot dogs and sandwiches count). Thanks for sharing!